Nonetheless, she never ceases to surprise me! 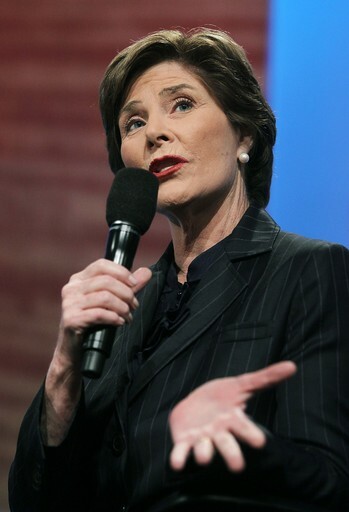 I recently found this picture of Laura Bush speaking at the 6th annual Clinton Global Initiative (CGI) on September 22, 2010 in New York City. Laura looks amazing in her dark black pant suit with small white pinstripes. The stark contrast between the suit and Mrs. Bush’s ivory face highlights her beautiful, fair complexion. And finally, Laura’s signature rouge lipstick color and white pearl earrings add that last bit of elegance, completing her refined look. This entry was posted in Laura Bush. Bookmark the permalink.